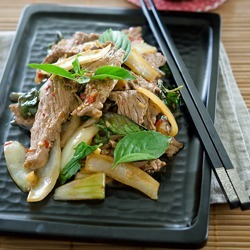 I used to think Thai food was not an easy cuisine to master. 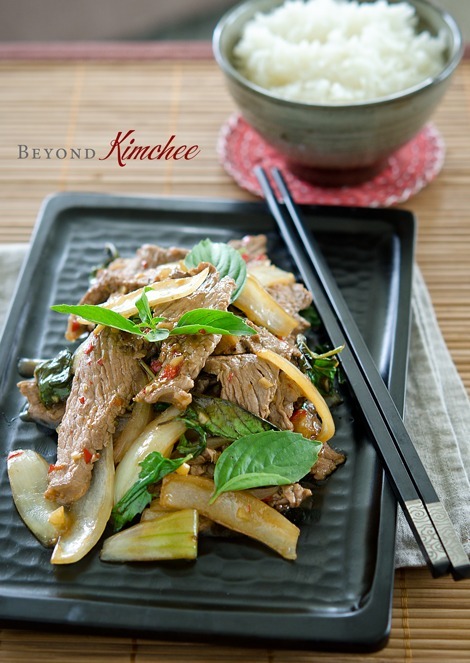 The flavor balance and the availability of Thai ingredients was not always easy to achieve. But, for living in SE Asian country, I can’t be more happier than getting everything I need to make good Thai dishes. 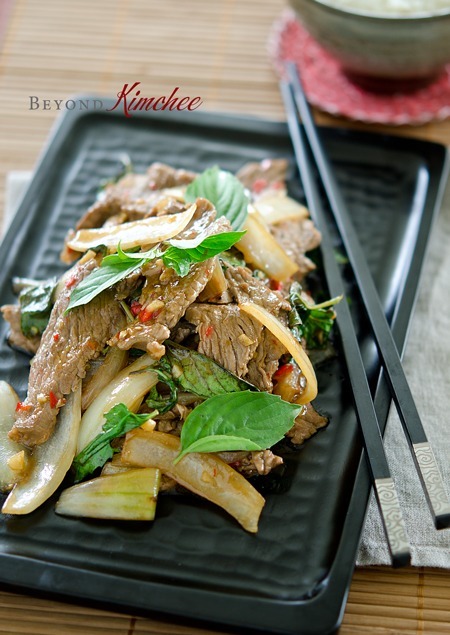 Here is one of the simplest and the most delicious Thai beef recipe; Thai Beef and Basil Stir-Fry. I LOVE Thai basil. It is very fragrant herb and a must for Thai cuisine. It is worth the trip to a specialty Asian grocery store to get this gorgeous herb if you can. However if you can’t find it, use any local basil. The fragrance will be a little different but still makes flavorful dish on its own. With a very few ingredients, you can whip this Thai dinner within 20 minutes from start to finish. What a perfect dish to tackle when you crave for an Asian meal but not wanting to slave yourself next to a stove? 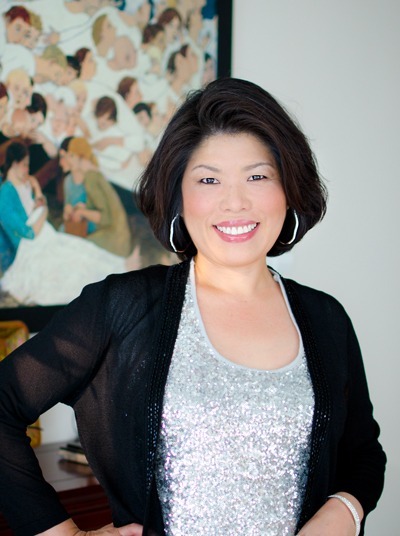 Make sure everything is all prepared and ready to jump in when you are ready to fire up your wok (or skillet). Here is the Thai basil. Tear the leaves from the stems and set aside. You will need a whole bunch. If you like Asian food, you gotta have these bottles in your kitchen waiting to be picked up; the oyster sauce and the fish sauce. 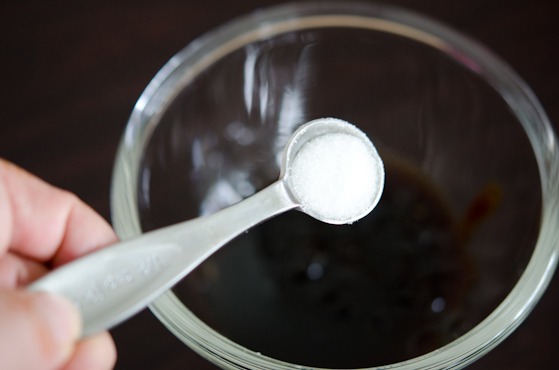 Combine those two sauces and add 1/2 teaspoon sugar and 1 tablespoon water. Mix them up and set aside. 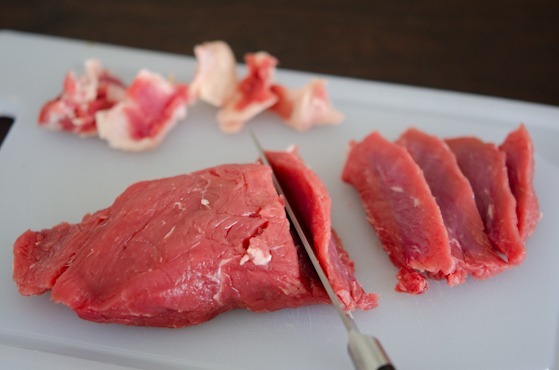 Trim the major fat from your beef and slice thinly against the grain with an angle. I used strip-loin for this recipe. 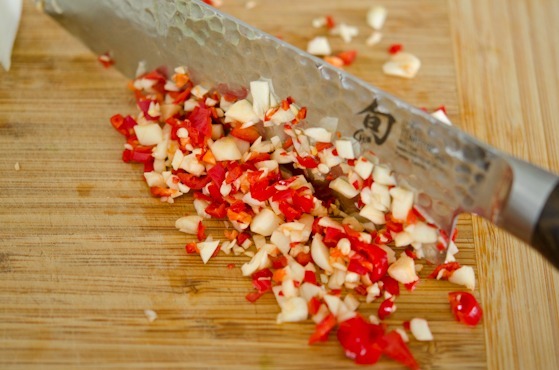 Chop garlic and chilies together. Slice one onion and set aside. Now make sure everything is right next to you and ready to go. 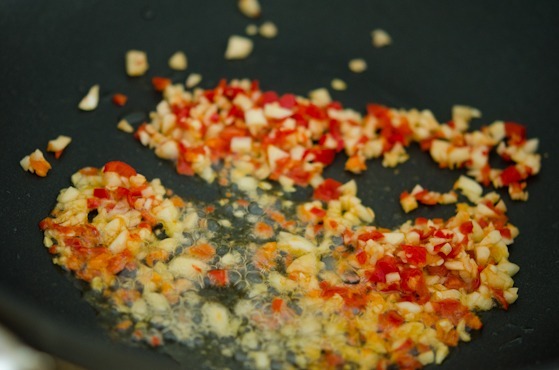 Heat oil in a wok or a deep skillet, stir fry garlic-chilies for 10 seconds. Throw in beef and quickly fry until they are just no longer in pink. Do not overcook your beef. Transfer to a plate and set aside. 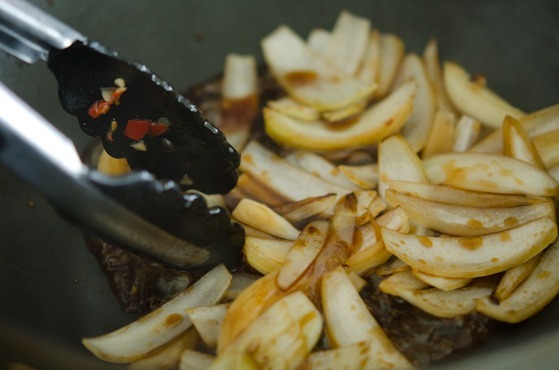 Quickly stir fry the onions and add the sauce, and stir again – busy, busy work for me. Stir frying and taking photos at the same time is not an easy task, I’ll tell ya. Add the beef, stir, and add the basil and remove the pan from the heat. The heat remaining in the pan is hot enough to wilt the herb. All done! Simple yet so flavorful! I had it with a freshly cooked Jasmin rice and it was just w-o-n-d-e-r-f-u-l! 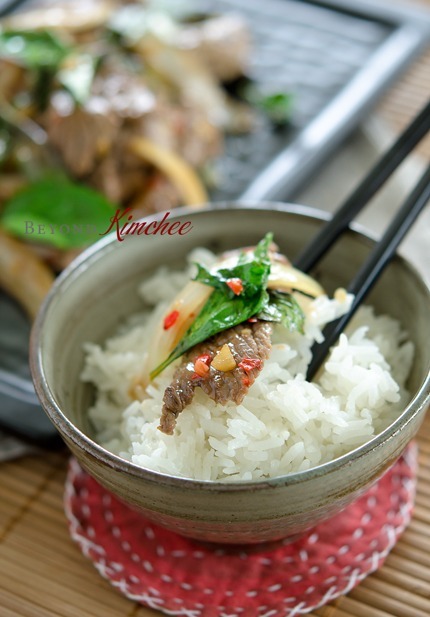 So quick and easy to prepare, who needs Thai take out? In a small bowl, combine fish sauce, oyster sauce, sugar and water. Mix well and set aside. Heat 1 tbsp oil in a wok (or skillet) over med-high heat and add garlic and chilies. Stir-fry for 10 seconds, then add the beef. Stir-fry until the beef is no longer in pink, about 2 minutes. Transfer the beef to a plate and set aside. Add the remaining 1 tbsp oil to the wok. Add the onion and the sauce. Stir-fry for 1-2 minutes until the onions are just soft. Add the beef and heat through. Add the basil leaves and remove the wok from the heat and shake everything to mix well. Serve immediately with jasmin rice. Gosh, you're so right that this is a simple and easy recipe - my favorite kind! Great job with this. I always enjoy your step-by-step pictures. 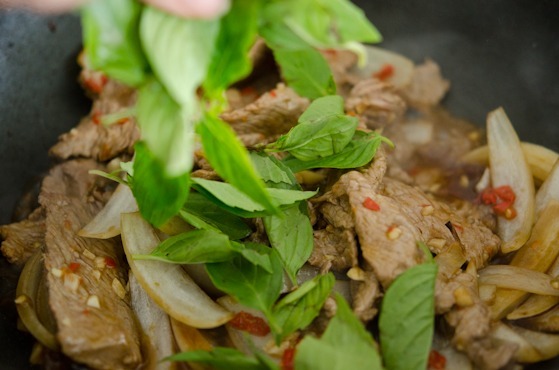 I need to get me some of that Thai basil! Really very nice - thank you so much. This looks so good, I wish I could reach through and grab it for lunch! I have that same oytersauce and I love it, I go through a bottle quite regularly....I have a smidge left...I need more! :) I have fish sauce but a different brand. I don't know why but I just don't use beef in my stir fry, after seeing this I am going to use it my next stir fry! 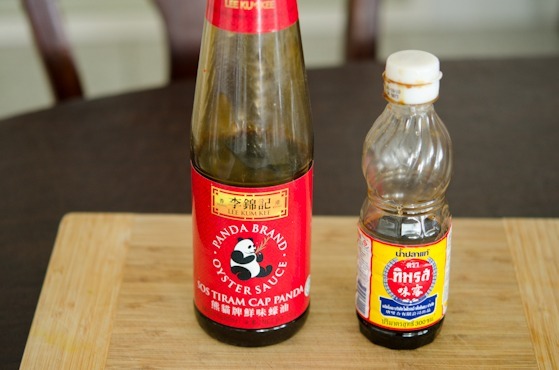 Oyster sauce is great Asian condiment. I use it quite often. I also find myself using fish sauce often in many things. Especially in salads, dipping sauces, and of course in stir-fries. I lovvveee Thai food -- thanks for a very fast and simple recipe. 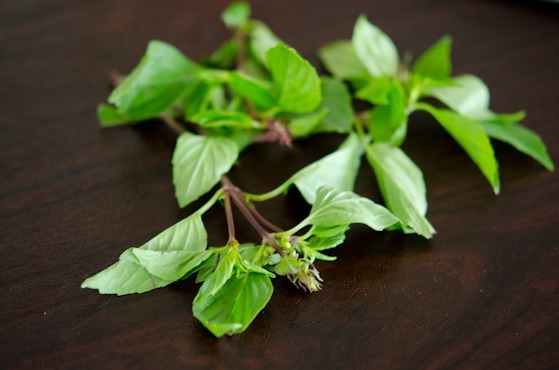 I've always thought of Thai basil as one of those magic ingredients that can transform a few ingredients into something wonderfully complex. Phographying Stir-frying is tough since You have to move fast, but I managed to do it okay I think. I must be well seasoned person dealing with hot stuff but I do pay a full caution when I cook things in high temperature. Thanks Esther. wow yeah this is so simple yet looks so yummy... im going to try this on my rest day yay! Yumm! Love this dish. I usually order the beef chopped. Can your children eat this? Seems quite spicy : ) tks for recipe! My daughter can handle spicy food better than my son. As long as I don't put too much, they can handle and they drink milk if it gets a little too much. For this particular recipe, I used 1 red finger chili (which is less spicy) and 2 bull's eye chilies. This looks delicious! I will definitely be trying this recipe. :) The Thai chilies are also known as bird's eye chilies, for anyone having trouble finding them. Holly, I made this 2 nights in a row it was so good! I couldn't find thai basil so I used purple basil instead. And I added a few bean-sprouts and oyster mushrooms because I had them. I think the trick is really good quality meat, don't you? Great recipe! Thanks, Emily. Adding bean sprouts and mushroom make this stir-fry a complete meal. I glad to hear that you liked it. Holly, This dish is my favorite Thai dish. 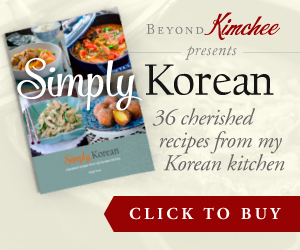 I would love to make it,but don't know how to find Thai Chilies or Bird's eye chilies. We have a huge Asian market near me, but it doesn't carry them. What would you suggest I get instead? Thank you. Look for red finger long chilies. They look like a size of your finger and they are milder than Thai bird's eye chilies. I have tried with minced beef (the recipe I got from a Thai friend) and the taste is equally good. Less cooking time because the beef is tender. The bird's eye chili and basil gives a spicy and tangy taste that will make you eat more or need second helpings. That's my experience. I tried with minced beef, too, and it is lovely that way. Adding some chopped snake beans (or green beans) to the minced beef in the same recipe will make a very nice dish. Hi Holly! Thank you for this amazing recipe-I made it tonight and it tasted delicious. I want to ask your advice on something. The meat came out pretty tough, I don't think I overlooked it, because I waited until it wasn't pink anymore. Do you think it's the meat itself or should I have cooked it a little more? Thank you in advance! Hi Irina Which cut of beef did you use? 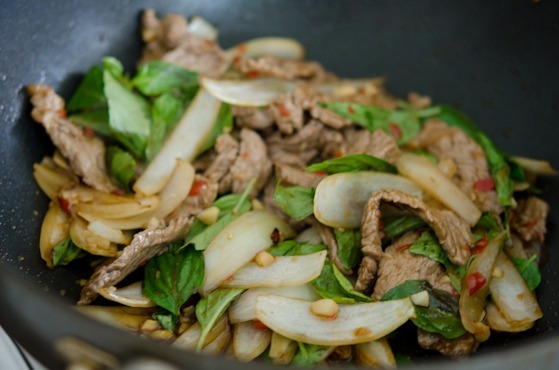 Not all parts of beef are ideal for stir-fry. I like to use striploin, sirloin, etc for stir-fry. Some cuts of beef are more for braising method since they are tough. I am glad that you liked it though. Very simple and (i try and check out a lot of recipes online) well presented. Easy to follow and worked a treat. I used european basil from the garden, rump steak and added a few vegetables and a little more fish sauce than the recipe. Highly recommended and as good as many good Thai restaurants. Thanks. I made this for dinner tonight and it was so good! I made a few changes.. I am allergic to fish sauce so I just swapped it for soy sauce, I also used organic coconut sugar instead of white granulated sugar and it still tasted great with those substitutions. I made twice as much sauce because I added green beans and broccoli to the sautéed onions (and I squeezed a lime over it after sautéing the veggies!). I added jalapeños and served it with brown rice. I searched the internet for a couple of days for the right recipe, I'm trying to eat clean and have been craving Thai food all week, this really hit the spot. My young nephews and mother in law (who is Korean and needless to say it was a little intimidating to cook asian food for her, this was my first time making an asian dish!) Thank you so much! I can't wait to make it for my husband (and of course eat my left overs tomorrow). I cooked this last night and it turned out great. I prepped all the ingredients (chopping and such) earlier in the day, so the cooking process was fast. We served it over cauliflower rice to meet our diet plan. what about the sauce mixture you had prepared? 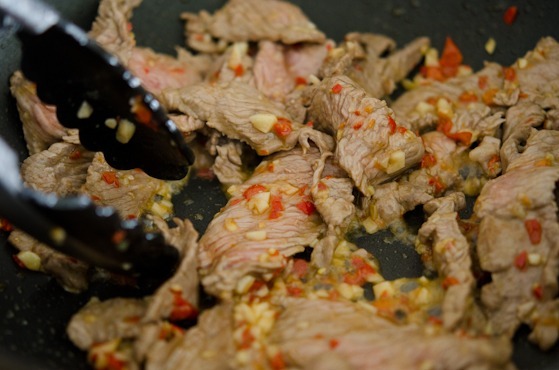 You add to the beef mixture toward the end of cooking.